Bred at Rosewood Farm by Helen Chambers, Zakee has been ridden by her daughter Dani since being started under saddle. From his very first competition under saddle as a four year old, a dressage competition where he placed 5th in his first test, Zakee has always flown his flag for the breed. Dani took him to his first jumping competition a month later, where he placed 4th overall and was 1st for best style over jumps. Since then he has amassed a huge number of awards over several different disciplines, including dressage, show jumping, eventing, hunter jumping and showing. Showing Highlights: Zakee’s first outing was as a 2 year old in the Led Purebred section at Rangiora A&P show where he won his class and Champion Led Purebred. Since then he has added Champion Led Purebred, Reserve Champion Ridden Arabian and the Judge’s Choice Cup at Courtenay A&P show 2014 to his list of wins. He has twice been Dani’s ride to first place in the Hi-Point Youth Award at the New Zealand National Arabian Championships, in 2014 and 2016. He won the Purebred Liberty class at the 2015 Canterbury All Arabian show, and at the 2016 New Zealand National Arabian Championships was the National Champion Costume horse. Dressage: 2015 saw Dani and Zakee selected for Okuku Pony Club’s A team to compete at the Amberley Cup dressage competition, where they gained the highest score for their age group and helped the team to first place and the Cup. At the Scandal Trophy competition 2016 they were 2nd in their dressage competition and clear show jumping to take the Neptune Challenge Cup. January 2017 they were competing for Canterbury in the NZPCA Dressage Championships, where they were placed 3rd in their first test and 4th in their second to help the Canterbury team win the South Island title and ultimately 2nd overall in New Zealand, the highest placed Canterbury team ever. They have also represented Dani’s high school in the Inter-schools Dressage Competitions each year. Show-jumping and Hunter Jumping: Kaiapoi Pony Club show-jumping competition 2015 1st 1.0m gamblers stakes and 3rd 1.0m TAM5. Rangiora A&P 2015 1st District Pony Hunter over jumps, 2nd 85cm instant jump off, 3rd 85cm speed round and 4th 1.0m TAM5. Oxford A&P 2016 Champion Novice Hunter Pony over jumps and Reserve Champion Open Hunter Pony over jumps. They have represented their own pony club Okuku and been a draft rider for Eyreton Pony Club at the NZPCA South Island show-jumping championships, and represented Dani’s high school in show-jumping. 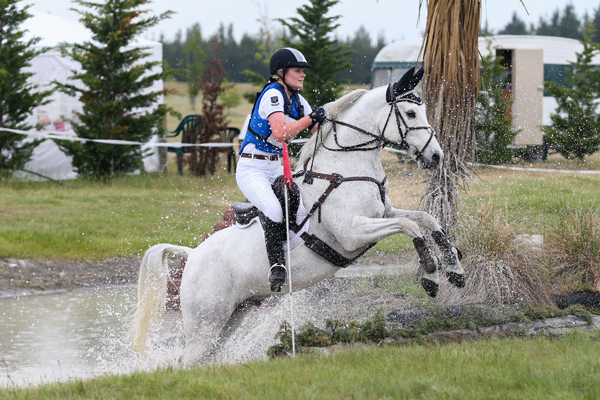 Eventing: 2015 was Zakee’s first season eventing, with great results, including Waihora Pony Club ODE competing at 80cm 2nd after dressage and double clear to win; Rangiora Pony Club ODE 80cm 7th dressage and double clear for 3rd overall; Roydvale Pony Club ODE 80cm 5th dressage and double clear for 3rd overall. In 2016 Dani and Zakee moved up to 95cm and ESNZ competitions, results included Amberley Pony Club ODE 95cm – 1st dressage and 1st overall; Springston Pony Club ODE 95cm 1st dressage and double clear for 1st overall; ESNZ Eventing Canterbury 2DE 7th dressage and double clear for 3rd overall. Dani and Zakee have represented Okuku Pony Club at Springston Trophy twice, and Dani’s high school at Inter-schools Eventing twice. Zakee has just moved up to competing at 105cm at ESNZ competitions, one of only a few ponies competing at this height. Pony Club: Zakee has been a part of many teams representing Okuku Pony Club at dressage, show-jumping, eventing and combined training. He and Dani won the Okuku Pony Club award for Best Pony Club Combination at the 2014 end of year prize-giving; a year later Dani won the Rider of the Year trophy. In 2016 when Dani and three fellow Okuku Pony Club members sat their C+ certificates, Dani had finished her ridden section (comprised of flat work, show-jumping and cross-country) and was about to sit her theory when it was discovered that the horse of a fellow Okuku member was lame (he had sat his theory part first). Dani offered Zakee as a replacement (luckily Cameron had ridden Zakee a couple of times before) and Zakee happily went through the workout again with the second rider, enabling both Dani and Cameron to pass their C+ certificates. Zakee also looked after a younger pony club member once when she came off her pony at a cross country training day and hurt her ankle, he very carefully carried her around for the rest of the afternoon, much to her delight. These are only a small selection of the many times Zakee has shown just what the Arabian can do, and do in style. He has accomplished a huge amount in a relatively short span of time, especially for an 8 year old and is a fantastic representative of the breed; always well-mannered when out and he gathers fans wherever he goes, and, hopefully, converts to the breed. He certainly demonstrates that the Arabian horse can perform to a high level in open company in any discipline and we can only imagine how much further he will go in the future.